BELIZE CITY, Mon. 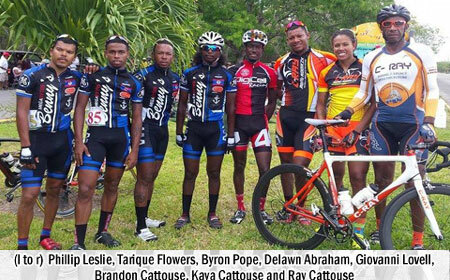 May 4, 2015–A contingent of 8 Belizean cyclists travelled to Cozumel, Mexico, over the weekend, and returned triumphant, after sweeping the top prizes in all categories of the Cedral Classic 2015 road race. The Elite/Masters “A” and U-23 road race was 60 miles long, and 1st place was taken by Brandon Cattouse, with 2nd place going to Byron Pope, and Phillip Leslie took the 5th position. For the U-23 category of the same race, 1st was Giovanni Lovell and 2nd Delawn Abraham. In the Masters “B” race, which travelled 45 miles, Belize was again dominant, as Ray Cattouse took 1st place, while Isaiah Willacey settled for 4th place. And in the 35 mile long Female race, Belize’s only participant, Kaya Cattouse took 1st place over Mexicans Laura Rodriguez of Merida, who was 2nd, Fabiola Rodriguez of Cozumel in 3rd, and Aracely Cervantes, also of Cozumel, in 4th place. Congrats to our Belizean cyclists for an outstanding performance!